Jessie’s first devil looked like her mother’s ceramic cat. It yawned and stretched on its kitchen shelf, its ginger belly stuffed with the batch of chocolate cookie Mama baked fresh just an hour ago. “Don’t you go crushing Mama’s cookies with all that stretching,” she told it, because she could hear them grinding against one another right inside that big old cat-shaped jar. “My Mama put her faith in you to keep them cookies safe,” said Jessie, who didn’t care for those who neglected their chores. “Then your Mama is a plain fool with too much trust in her heart,” said the devil. 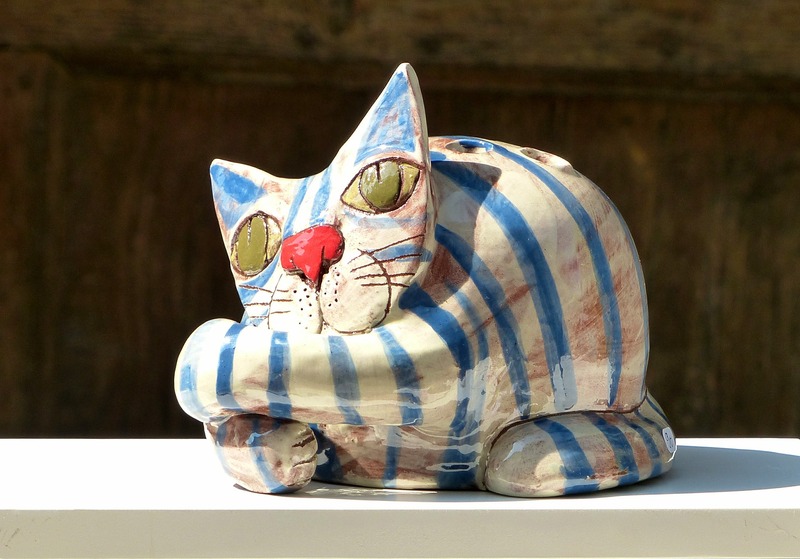 Showing a spiteful side Jessie would come to learn was the whole of a devil’s nature, the ceramic cat jumped down onto the kitchen table, stretched out long as a snake, and rolled back and forth on its belly. In no time the crunching of crushed cookies became the sound of churning sand. Jessie said, “I’ll teach you not to disrespect my Mama,” and she laid into that devil with Mama’s claw hammer. The devil howled and cursed her as she worked, but pretty soon she’d pounded the shards of ceramic cat every bit as fine as cookie dust. Mama didn’t understand when Jessie explained it and gave her a good tarring with her feather duster and no dinner besides, but Jessie didn’t mind so much at all. That was the day she learned she could fight devils. The next devils she met were the teacher twins, Bianca and Helen, who took Jessie for mathematics and fine arts. They were both good teachers, in their own way, but they would be forever asking Jessie to stay after class. “Jessie Rose, you must write these lines,” Bianca would tell her, and make her write crude words and magic symbols on the chalkboard until it was full. “Jessie Rose, you must scrub the chalk from these floors,” Helen would say, handing her a brush and a bucket. Neither would let her leave until the chores were done, and while she worked, they would each tell Jessie spiteful gossip about the other. She knew they wanted her to pass their petty cruelties on, but she never did. In time she guessed that the sisters wanted her to choose between them in some way. Jessie kept her silence and endured their pointless labours, all through high school until its very last day. Jessie started calling herself Jessica and dedicated herself to two things: the getting of knowledge and the banishing of devils. One devil tried to tempt her with free tickets to a cruise with the man of her dreams, but there were no men in Jessica’s dreams so she declined. Where did these devils get their information? She often wondered. While Jessica was graduating at the top of her class, the cruise ship got stuck in a mid-ocean garbage patch for a whole week. When it came time for her to begin a career, a devil came to Jessica in the form of a great idea for a novel. She didn’t recognise it for what it was at first, and began to work on it, day and night. Jessica turned down invitations from her friends, and calls from her mother went unanswered for weeks. But the devil over-reached itself. It was not satisfied just to eat Jessica’s time, it wanted to waste it too. It gave her more ideas, too many to use. It left browser tabs open to intriguing research topics. One week, it subscribed to three new social media apps. Jessica lost momentum and abandoned the novel. The devil withered. Jessica Rose took a job in a busy law firm and defended clients with unusual circumstances. Once, she represented a devil arrested for impersonating the star of a celebrity cooking show. The devil, called Kleo, managed to stand in for the real chef – also Kleo – for six whole weeks without anyone noticing that the star had checked herself into a clinic to treat her addiction to collecting figurines with oversized heads. Jessica had learned never to trust her devils, but she was impressed that Other-Kleo managed to record half a season of Cook Yourself Out of the Corner episodes without giving the game away. She convinced the production company to settle the case before word circulated of their inadequate studio security and rampant neglect of their star’s wellbeing. It didn’t hurt Jessica’s argument that the devil’s episodes were more popular than the rest of the series. Deciding it was time to strike out on her own, Jessica quit her job and started a private practice to help people with devil problems. She offered Other-Kleo regular consultancy work; devils being adept at turning their hands to new tasks, she accepted. They built a successful business and eventually moved into a flat together. Sign up for occasional chatty emails about what I’m up to and some free short fiction (guaranteed). This entry was posted in Friday flash fiction and tagged celebrity, devils, fantasy, flash fiction, food, Friday flash, modern, seven devils for jessica rose, social media. Bookmark the permalink.